Home › Reviews › Is CastingWords A Scam? Like most of my reviews, I start off with the question, Is CastingWords a scam? Is it possible to make money here? What do they pay, how do they pay? Also, maybe some tips on performing better at CastingWords. You can find the answers here. Why here, because I have used CastingWords and I am still a transcriber there, while I am not expert transcriber I can lay out some helpful insight to using their platform and shedding light on this company that pays people to listen to audio then turn that audio into text. What is CastingWords? CastingWords is a transcription company based in New Mexico, that was founded in 2005. You can get audio transcribed or attain work by transcribing audio for CastingWords. 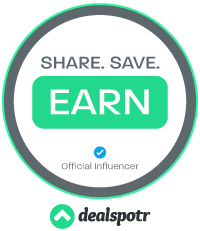 The latter is what I will be reviewing, as this is a way to earn money online. You can also check out my guide to Types of Jobs Online, where I show other companies that hire transcribers. So, what is transcribing? For those that do not know, it’s where workers listen to audio files and then accurately convert that audio file into a text file. The audio files can be short 1 minute or as long as an hour. There are generally two types of transcription jobs, medical and general. CastingWords is for general transcriptions. A computer and internet connection. Transcription software – I recommend using Express Scribe Transcription software. Free and Pro Version available. Good typing speed and accuracy. Spelling and grammar skill is necessary for production speed. Grading is done by other workers. 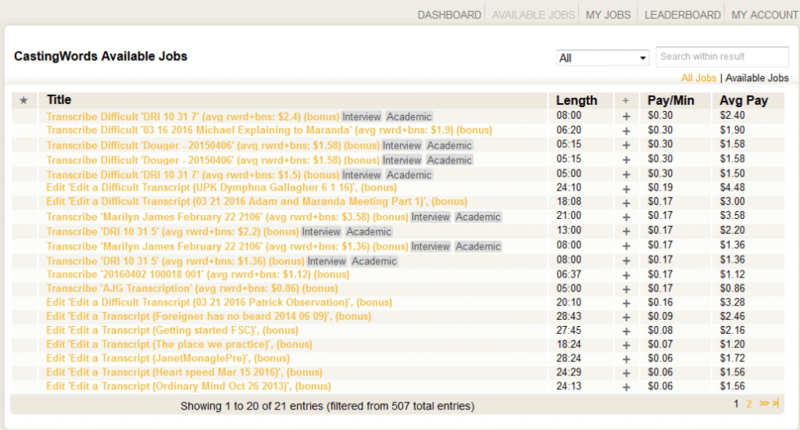 CastingWords is looking for scores around 8 or 9, but have lower expectations from newbies. Grades are scored 0 through 9, with zero the lowest score and 9 the highest score. No Experience Required. Easy for newbies to get started with gaining experience here. Some transcribing companies want 2 years minimum experience, not here at CastingWords. If it’s the sort of work you enjoy it’s a great platform to build your resume on. CastingWords pay you through PayPal and the minimum is a dollar. Love PayPal and the low amount, great payment features. They also pay the PayPal fees (which is usually 4% fyi), so you get all the money you earned. Not a lot of companies do that. Compensated for hard to understand audio, either a hard to understand accent or low volume or background noise. These are best left to experience transcribers. Difficult audio is clearly labeled…but some does slip through. Some audio is exciting or interesting. You are rewarded per job for a high grade, which is called bonus pay. 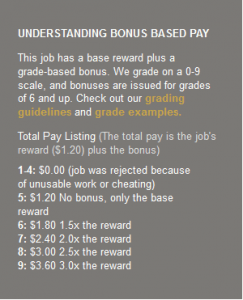 Anything above a grade of 6 will earn bonus pay. It pays 3.0x the reward for a nine score. If you live in a foreign country, you probably can work for CastingWords. There list is very long for countries that they allow to work from. A nice overall layout of the site. Everything is easy to find. Different jobs available not just transcribing. There is also Editing, grading and audio assessment. Jobs are available at all hours of the day. There is no set schedule, so you work when you want and how often. Some audio is hard to hear, either in volume, crosstalk, or accents. This can be a real hair puller after a lengthy section. You are generally paid more for hard to hear or hard to understand audio. Transcribing is not easy work, it’s time-consuming, hard to hear at times, lots of rules to follow. Grading – It is hard to in my opinion to get a good score on a job. I’ve gotten I think one 9 grade. Time limit on jobs once you accept the job. But I never missed a deadline, they give you enough time to finish. Some audio is extremely boring. Graders are tough to impress and expect perfection. If your not perfect they will find it. If your not fast and accurate typist, you won’t make decent money. If you have experience with other transcribing companies, read CastingWords Guide Lines as every company has different rules, and there are many to learn. The most important tip I can give you is read the Style Guide, then read it again, and again, and again. I’m so not kidding here if you are committed to doing transcribing work, do yourself a favor and read the Style Guide many times. This will lock in their lengthy rules and get you earning more bonuses. This is a pretty thorough and lengthy guide that will greatly help you do this job. Make the Style Guide your friend too, by always having it up when transcribing. Make notes if you have to, to easily find specific guidelines for grammar. Click the Get Audio button and listen to a little bit to the actual audio, before you began working on a particular job. If you find it acceptable, you can click on Work On This Button. You can generally hear if there are accents to deal with, how clear the audio is or if it will just work for you, as your going to becoming intimate with this audio and also committed to completing it. It is better to listen to a sample and skip it, then to accept the job and then return it because you can transcribe it. I highly recommend the Infinity IN-USB-2 Universal Foot Peal. I got mine on Amazon, and I think I paid $50.00 for it. It will significantly help speed up your transcribing time. Basically, you have three buttons: a left, a middle and a right pedal. You can set these up however you would like. I think I set up my left pedal for reverse, my middle for pause, my right pedal for slow speed. It saves you from taking your hand off the keyboard and putting it on the mouse to pause or rewind the audio. A MUST HAVE!!! You will not be perfect or efficient in the beginning, this job takes time. Have patience, and practice to become better. There are a lot of fun typing games online. (just search for them) Which will help get your speed up. When I first started out, I looked for the 1-minute audio that I qualified for and did these. At first, it seems like it takes forever, so the 1-minute ones were not so tedious. Then when you comfortable start increasing the amount of time for audio length. You will get audio or parts of the audio that is next to impossible to understand. This is where a nice set of headphones come in. Now I wouldn’t go buying a two hundred dollar headphone set, but if you already have then use them. It helps to understand more clearly. A decent $30.00 pair should work. I also like to have my phone nearby to ask Google by saying Okay, Google, or if you have Siri to ask Siri. You will run into words you have never heard before, technical words or medical words, this is the quickest way I have found to find the correct spelling. Pay attention to Avg Pay and Pay/Min within the CastingWords Available Jobs area. The Avg Pay is what you will get if you score a 7, anything scored less than 7 equals less money you will get, but if you score higher than 7, you will receive more pay for that job. The Pay/Min is there to help you find the higher paying jobs. Like Avg Pay, it’s in the same way with seven as the standard. Stay away, far away from heavy accents especially Indian accents, unless you have an Indian accent and which you can probably understand it quite well. They say it takes anywhere from 3 to 4 times the length of time to finish a job, so if a job is 5 minutes long expect to work on it at least 20 minutes or more. The newer you are, the longer it takes to finish. It can go even way past 3 to 4 times but remember your new and learning. Example of my work at CastingWords with Grade and reason for the grade. My only Grade 9. There are quite a few alternatives to CastingWords. If you want to work from home and to have moderate typing skills with good English writing skills, this is a decent way to make some money. Plenty of references to correct transcribing are found in CastingWords. To there must read Style Guide, Transcribe Grade Examples, Sample Transcript, Rare Situations Supplement and Editor Supplement and FAQ. That is a lot of information that needs to be read to get good grades here. They provide the necessary tools to get there. They have an active Facebook group that can help you if you need support. These are active transcribers and workers at CastingWords. I have gotten a few problems fixed and questions answered by contacting support at workers@castingwords.com, in a timely matter. Is CastingWords a scam? No, it is not a scam. They pay and weekly too. If you are a detailed oriented person with excellent typing skills, good written English skills, and a keen ear, transcribing is right up your alley. As I feel the rules are rather lengthy and complicated for an average individual, but I’m not excluding them either. It is hard to attain a grade of 9 here and is probably the most controversial subject related to CastingWords, as many opinions on the internet think that it’s rigged, so you don’t get a grade of 9 hardly ever. I support this theory, that getting a score of 9 is very very hard. I only did it once because the job I had was just intro music, with no words. So all I had to put was [music]. So expect to get 7’s and 8’s and maybe a miracle 9 once in awhile. But other than that it’s not a bad way to pull in extra money. If you are looking for a 100% legit way to make money, by owning your own online business. Stop working for someone else and invest in yourself! Take the next step to financial freedom. It provides the best training online along with the most helpful and friendly community online, with all the support to get you building your online business. I recommend you read my #1 Recommended Program and sign up to get started today. As with any page on my website, I welcome comments and questions and would love the chance to respond. Thanks. Dan, I enjoy reading this review. Those who are looking for a job from home like me will find this review very useful. I have looked at the CastingWords website but i don’t find other jobs, not only transcribing, like you mention. How about that? Erna, I’m glad you enjoyed it. Once you go to their homepage, scroll down to the bottom and click on Transcribers. After you have set up your account, go to your dashboard, once there click available the Available Jobs in the upper right hand side of screen. This will show you all available jobs, This is where all jobs are located at. The first word is usually Transcribe or Edit or whatever the jobs could be. Right now for me it just shows Transcribe and Edit, but this changes during the coarse of the day, as new jobs are release and old jobs are completed. To work on a Edit job or Transcribe job or any other job just click it. Not all jobs will be available to you, you have to earn badges through high grades. High grades over a period of time you receive badges, these badges allow you access to different jobs as well as higher paying jobs. Hope this helps. Let me know how it turns out. Very interesting opportunity, Dan. I have not heard of this. How long have you been doing this and what kind of income has it translated into? I am relatively new to transcribing. I started transcribing in November 2015. I was making around $15.00 a week when I first started as I wasn’t putting a lot of time in. I was just getting my feet wet. I wasn’t doing that many hours to make a good wage. But I know quite a few people do make decent money, but are more skilled than me. I found transcribing, wasn’t for me in the long run and I found other ventures to follow. But I am glad I invested time and enthusiasm in CastingWords. I learned a lot. Thank you for the review. It really helps to know that there some products that are legit online. A review like this helps solve the problem of work online, which for long has been almost about scams. Every time you bring out work online, people your friends will tell you don’t even try because they are going to take your money. I have really enjoyed your review. Your welcome. The online world is filled with scams and that’s why it’s so important to research before doing just about anything online. I have found many real winners as well as many horrible scams, I enjoy helping people avoid scams. It’s true people’s first impression of work online is one of dishonesty. But with a little searching these can be easily avoided. Thanks for the comment. Hi Dan. Very informative. I have been curious about these transcribing kinds of opportunities, but have never invested the time to investigate them properly yet myself. Hey Bruce, thanks for the kind words. Transcribing is definitely a way to make money online and I am so glad to get the word out, to help people be more informed about the different employment opportunities online. I hope this post does this. Hope to see you around. Interesting post, I didn`t know about this stuff, I was getting excited about it till I read you have to be a quick typist to make a bit of money. I am a one finger typist I am getting better tho since I have been at WA. Lou, yeah, it really helps to be a fast typist on CastingWords. But as you mention, you can become a better typist by just practicing correct typing hand placement along with hours of typing repetitions. You Can do a search for games for typing, which help kill the boredom of tedious typing nonsense. So once you have better typing skills they are with you for life. CastingWord is a decent company that definitely pays. Ha! That ending part when you explained that score 9 you’ve earned! I already failed that entry test (application test) and have to wait 7 days to retake it. Now I know how difficult it is you talked about. Sorry, I laughed a little bit, not because you failed but because I remember how hard it was. It is very detailed oriented and you must have good English writing skills. My writing skills have improved a lot after working for CastingWords, but they are by no means perfect. I really tried hard to excel at CastingWords but to be honest I wasn’t detailed oriented enough and struggled severely with hard to understand speech. But keep trying if it is what you want to do, it gets easier the more you do it. Also read the style guide numerous of times. Hope this helps. I haven’t been on the site in a long time but from what I remember the pay always varied depending on experience, rating and type of job. I have no idea if they pay differently for which country you work from. It might be that there isn’t much being offered at the moment too. Try and contact someone there and ask, see what they say. Hope this helps if not let me know. No, it doesn’t depend based on country. It only depends on the level of the job and I think sometimes, the level of difficulty as well. And by level of the job, I mean the transcribing level you must be at in order to take on a higher-paying assignment. Thanks, G90 for help clearing up this matter. Good to know!